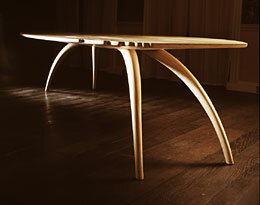 John Makepeace will showcase his work at the exhibition featuring his dining table, Vault (see image to the right). Vault articulates the extraordinary properties of indigenous ash as a structural material. Liberated from the rectilinear forms predicated by traditional industrial processes, here the principles of sculpture, science and structural engineering in timber merge. John and Jennie Makepeace will be welcoming people to their gardens in Beaminster on a series of open days to support the charity, National Garden Scheme. Visitors will recognise John as a talented furniture designer and maker but they may not realise that he also is a talented garden designer. His newly built Bridge Garden combines grasses and other architectural plants in a secret but dramatic retreat. See the NGS web site - , for further information. Furniture designer and maker John Makepeace will be addressing an audience of leading furniture makers and designers in the United States in Boston on 18th June. The conference is entitled Fusions - Minds and Hands, Shaping Our Future. His provocative presentation to furniture designer makers will encourage the more intelligent and sustainable use of indigenous timbers, always a 'hot potato' in the States where exotic materials are still used as a status symbol. More information can be found on the The American Furniture Society's web site - . A landmark retrospective exhibition of the work by John Makepeace, sponsored by the Arts Council, shows John's furniture over the 50 years of his career. Co-ordinated by the Devon Guild of Craftsmen, the exhibition is touring major galleries across the UK. The Goldsmiths' Company Pavilion is London's premier summer destination for innovative and inspirational design, with over 100 of the top jewellery, silver and furniture designers working in the UK. John and Jennie Makepeace will be welcoming people to their house and gardens in Beaminster to support the charity, National Gardens Scheme. Plants for sale and light refreshments will be available. For full information visit the NGS website - . Design Shanghai will feature an extensive seminar program of prolific western and eastern designers, meeting for the first time to discuss the future of design. A varied and challenging programme of seminars, debates, presentations and demonstrations will marry contemporary Western influence with modern Chinese creative ambitions. For full information visit the Design Shanghai website - . To raise funds for Dorset Visual Arts, furniture designer/maker John Makepeace and artist Jennie Makepeace invite you to their inspirational historic house and gardens, recently featured on BBC2's Gardeners' World - . 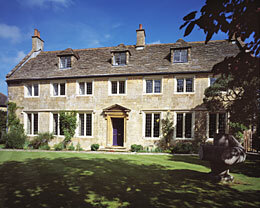 The house shows a collection of John's furniture and contemporary artworks. John's furniture was selected to represent the UK in Design Shanghai, earlier this year. The four distinct areas of garden include Jennie's colourful potager with a new cleft oak fruit cage, the glasshouse and 'straw bale' retreat adjoining John's inspirational grass gardens, rolling lawns, sculptures and yew topiary. For more information visit the Dorset Art Weeks website - . Visitors will recognise John as a talented furniture designer and maker but they may not realise that he also is a talented garden designer. The International Art Fair for Contemporary Objects brings together the world’s finest galleries representing exceptional work of museum-quality from their portfolio of artists. International galleries and selected Project Space artists will come together at the Saatchi Gallery. "4 days of the very best collectible craft, 37 international galleries, over 400 artists. Ceramics, glass, jewellery, textiles, wood, furniture, silver, fine metal work. See and buy the world's finest contemporary craft at the 11th edition of COLLECT, returning to the Saatchi Gallery from 9-12 May." For full information visit the Crafts Council website - .